The Three Magi offering gifts. Romanesque mosaic from the Basilica of St. Apollinarius in Ravenna, Italy. The word Magi refers to a class of ancient Zoroastrian astrologer-priests who once lived in the Persian Empire. Today, the word is most commonly used in Christian circles to denote the Three Wise Men (Magi), who came "from the East to Jerusalem," following a bright star, to worship the Infant Jesus (Matthew 2:1). It is said that among their gifts were gold, frankincense, and myrrh. In this way, the Magi were the first people to symbolically acknowledge Jesus as the "King of the Jews." The journey of the Magi is still commemorated today in nativity scenes and Christmas carols, and they are seen as personifications of both generosity and dedication. Yet, despite their prominence in the birth narrative of Jesus, the fate of the Magi is elusive and it can be questioned why they did not return later in life to worship and attend Jesus if they truly ascertained his alleged divinity. The word Magi is the origin of the English words magic and magician. Magi is a transliteration of the Greek magos (μαγος pl. μαγοι), which is a derivative from Old Persian maguš. The term is a specific occupational title referring to the Zoroastrian priests of the late Persian Empire. The Greek word is attested from the fifth century B.C.E. as a direct loan from the term maguš, which is a Persian u-stem adjective from an Indo-Iranian root *magh, "powerful, rich." This root (*magh-) appears to have expressed ability, which is also seen in Attic Greek mekhos (cf. mechanics) and in Germanic magan (English may), magts. The original significance of the name for the Magi thus seems to have been "the powerful." Avestan has the related terms maga and magauuan, meaning "sacrifice" and "sacrificer" and the modern Persian Mobed is derived from an Old Persian compound magu-pati, "lord priest." According to the Greek writer Herodotus, the word magos was held by aristocrats of the Median nation and specifically to Zoroastrian astronomer-priests. In Herodotus' writings, the term magos usually referred to a member of the tribe of the Medes (1.101) who could interpret dreams (7.37). However, with the spread of Hellenism, magos started to be used as an adjective, meaning "magical," as in magas techne, "ars magica" (e.g. used by Philostratus). Some translations of the Bible, such as the King James Version and the New Revised Standard Version, render magos as "Wise Men." Yet, the same Greek word is rendered as "sorcerer" or magician in the account of "Elymas" the sorcerer in Acts of the Apostles 13 . The term is also used to identify Simon Magus in Acts 8. The three pagan kings were called Magi not because they were magicians but because of the great science of astrology which was theirs. Those whom the Hebrews called scribes and the Greeks, philosophers, and the Latins, wise men, the Persians called Magi. And the reason that they were called kings is that in those days it was the custom for the philosophers and wise men to be rulers (Vita Christi). The Magi were the sacred caste of the Medes from ancient Media (inhabitants of Persia ), who were responsible for the religious and funerary practices, and who eventually accepted the Zoroastrian religion. The Magi organized Persian society after the fall of Assyria and Babylon. However, their power was curtailed by Persian Emperor Cyrus the Great (c 585 – 529 B.C.E. ), founder of the Persian Empire, and by his son Cambyses II; the Magi revolted against Cambyses and set up a rival claimant to the throne, one of their own, who took the name of Smerdis. Smerdis and his forces were defeated by the Persians under Darius I. The sect of the Magi continued in Persia, though its influence was limited after this political setback. During the Classical era (555 B.C.E. – 300 C.E. ), some Magi migrated westward , settling in Greece, and then Italy. For more than a century, Mithraism, a religion derived from Persia, was the largest single religion in Rome. The Magi were likely involved in its practice. The Book of Jeremiah (39:3, 39:13) gives a title rab mag ("chief magus") to the head of the Magi, Nergal Sharezar. It is also believed by Christians that the Jewish prophet Daniel was "rab mag" and entrusted a Messianic vision (to be announced in due time by a "star") to a secret sect of the Magi for its eventual fulfillment (Daniel 4:9; 5:11). After invading Arabs succeeded in taking Ctesiphon in 637, Islam largely superseded Zoroastrianism, and the power of the Magi faded. Many (but not all) of the Magi fled the advent of Islam in Persia by emigrating to India, settling in western principalities that form the modern states of Gujarat and Maharastra. As one can only be Zoroastrian by birth, the number of Parsis and Zoroastrians in the world is shrinking. Suffice to say Parsis are very rare, and Magi are even rarer. According to the Gospel of Matthew, the Magi were the first religious figures to worship Christ. It is said the Magi traveled from the east following a bright star that lead them to Jerusalem. They first visited Herod (appointed as a vassal king of Judea by the Roman Empire), asking him where the new king could be found. Herod, showing his knowledge of local prophesy, sent them to Bethlehem, and asked that they return when they had found him (Matthew 2:1–8). There, they appeared before the infant Jesus, and offered him gifts of gold, frankincense, and myrrh (Matthew 2:11). Of these three gifts, the last is the most important: Myrrh was an herb that was mixed with oil to make a chrism, the ointment marking Jesus as a royal figure, a king. Accordingly, the three gifts are interpreted as prophetic emblems of Jesus' identity: (1) Frankincense was an incense used in temple worship and speaks of Jesus' priesthood. (2) Gold speaks of Jesus' kingship. (3) Myrrh, was a spice or balm used in preparing bodies for burial, speaks of Jesus' atoning death. After offering the gifts, the Magi were warned in a divine dream not to go back to Herod, and so returned to Persia by another route. This infuriated Herod and resulted in his massacre of the Holy Innocents (Matthew 2:12, 16–18). As judicial astrologers, the Magi were known for the respect of spiritual light and rejection of spiritual darkness. The star that was rising in the east, was interpreted by hearers of Matthew as the fulfillment of the "Star Prophecy" from the Book of Numbers 24:17:—“There shall come a star out of Jacob, and a sceptre shall rise out of Israel, and shall smite the corners of Moab, and destroy all the children of Sheth." However, the Star Prophecy was not alone in identifying Bethlehem as the natal place for a coming king: an interpretation of the Book of Isaiah presented before Herod also identified Bethlehem as the birthplace of the Jewish Messiah, who would be a descendant or "son" of King David. Yet, again, the clearest prophecy of Bethlehem as the birthplace of the Messiah is found in Micah 5:2, "But you, Bethlehem Ephrathah, though you are small among the clans of Judah, out of you will come for me one who will be ruler over Israel, whose origins are from of old, from ancient times." 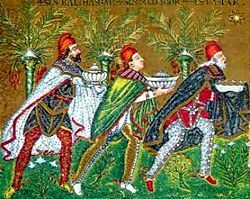 The traditional names of the Magi in the West are Caspar (or Gaspar), Melchior, and Balthasar (or Balthazar). Caspar is sometimes given as Gaspar, a variant of the Persian Jasper—"Master of the Treasure"—from which the name of the mineral jasper is derived. However, other cultures have different names for the Magi. For example, the Syrian Christians use Larvandad, Hormisdas, and Gushnasaph, and in Ethiopian Christianity the Magi are named Karsudan, Hor, and Basanater. The names of the Magi do not appear anywhere in the New Testament nor do the Gospels state specifically that the Magi were three in number. According to Christian tradition, it is generally accepted that there were three Magi because three gifts were given to the infant Jesus; however, many gifts were given to the child that night as well as gold, frankincense, and myrrh. These last three gifts, because of their price and significance, became worthy of note. The account of the visit of the Magi in the Gospel of Matthew has been a popular topic for Christian art and literature. The scene has been found in the earliest Christian pictorial art, and it was a popular tableau in the Renaissance. 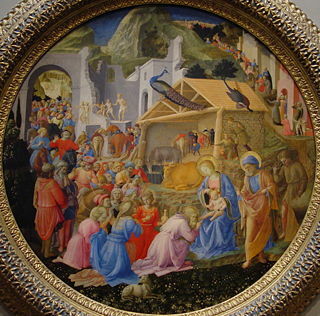 The Three Wise Men are most frequently portrayed in the scene of the Adoration of the Magi and less often in the scene of the Journey of the Magi. More generally they appear in popular nativity scenes and other Christmas decorations that have their origins in the Neapolitan variety of the Italian presepio or nativity crèche; they are featured in Menotti's opera Amahl and the Night Visitors, and in several Christmas carols, of which the best-known English one is "We Three Kings." An early Anglo-Saxon picture survived on the Franks Casket, probably a pagan king’s hoard-box (early seventh century C.E., whalebone carving); or rather the pagan king’s hoard-box survived because of the picture . In its composition, it follows the oriental style, which renders a courtly scene with the Virgin and Christ facing the spectator, while the Magi devoutly approach from the (left) side. Artists have also allegorized the Magi to represent three different parts of the world. Balthasar is often represented as a young African or Moor and Caspar may be depicted with distinctive Oriental features. In modern literature and film, Henry van Dyke (1852 – 1933) wrote The Story of the Other Wise Man (1896), which described a fictional fourth Magi who, on the way to see Jesus, stopped to help a fellow person in need and therefore missed Jesus' birth. Nevertheless, the book shows that the Magi's caring efforts were more in keeping with Christ's love than any physical gifts could be. Van Dyke's inspirational story was released as a motion picture in 1985 under the title The Fourth Wise Man. In the twentieth century, T.S. Elliot (1888 – 1965) wrote a poem entitled "The Journey of the Magi" after his conversion to Christianity and confirmation in the Church of England. The poem is an account of the journey from the point of view of one Magus. Hollywood also added further sentimental detail to the narrative of the Magi in the movie Ben-Hur (1959), where Balthasar appears as an old man who goes back to Palestine to see the former child Jesus become an adult. Most Christian celebrations of the birth of Christ often involve depictions of the Magi, which take on their own distinct cultural flair around the world. In the Roman Catholic Church, the visit of the Magi to Jesus is commemorated on the Christian observance of Epiphany, January 6. The Epiphany is also called the "twelfth day of Christmas" because it falls twelve days after December 25th. In Spain and throughout the Spanish-speaking world, the three kings (Sp. los Reyes Magos de Oriente, also Los Tres Reyes Magos,) receive wish letters from children and magically bring them gifts on the night before Epiphany. Spanish cities organize cabalgatas (cavalcade) in the evening, in which the kings and their servants parade and throw sweets to the children (and parents) in attendance. The cavalcade of the three kings in the city of Alcoi claims to be the oldest in the world; the participants who portray the kings walk through the crowd, giving presents to the children directly. It is also told that the Wise Men come from the Orient on their camels to visit the houses of all the children; like the northern European Santa Claus with his reindeer, they visit everyone in one night. In some areas, children prepare a drink for each of the kings, it is also traditional to prepare food and drink for the camels, because this is the only night of the year when they eat. In Germany, the Shrine of the Three Kings at Cologne Cathedral, according to tradition, contains the bones of the Three Wise Men (John of Hildesheim). Reputedly they were first discovered by Saint Helena (c. 248 – 328 C.E.) on her famous pilgrimage to Palestine and the Holy Lands. She took the remains to the church of Hagia Sophia in Constantinople; they were later moved to Milan, before being sent to their current resting place by the Holy Roman Emperor Frederick I (c. 1123 – 1190 C.E.) in 1164. However, this view conflicts with other reports. According to Marco Polo (c. 1254 – 1324), the tombs of the Magi were located at Saveh, south of Teheran, in the 1270s. In Italy, the Milanese celebrate their part in the tradition by holding a medieval costume parade every sixth of January, and in North America the Magi are still remembered in the familiar Christmas Carol "We Three Kings" written by John Henry Hopkins, Jr., in 1857. In the twentieth century, the term Magi was appropriated by the fantasy genre of role-playing games, movies, and novels. It is common for both role-playing and computer games to frequently involve Mage, characters who specializes in magic. Even though the story of the journey of the Magi is often told in Christianity, the precise sequence of events, the nature and meaning of the events, and whether they actually happened is under constant discussion by biblical scholars. There is considerable controversy concerning the timing of when the Magi initially saw Jesus. The collective weight of testimony from both Matthew and Luke makes a visit by the Magi on the night of the birth dubious. Roman Catholic biblical scholar Raymond E. Brown in The Birth of the Messiah lists several reasons he does not believe the biblical account, including the fact that such a bright star would have been mentioned by others, but despite fairly good astrological records it is mentioned nowhere. Astronomer Michael R. Molnar and others have taken the view that Matthew's statements that the star "went before" and "stood over" are terms that refer respectively to the retrogradation and stationing of the royal wandering "star" Jupiter. If Molnar's research is correct, the original and unusual event marking the birth of a great Jewish king took place April 17, 6 B.C.E. Later that same year, Jupiter would have reversed direction starting August 23 and would have stationed December 19, which could suggest that the magi arrived at or after that time. The interval of at least eight months since the birth could reasonably accommodate a journey from the east by the Magi to see the unusual king. None of the story is mentioned in Luke or the other Gospels. For this reason, some scholars, such as Robert H. Gundry, speculate that the author of Matthew transformed the shepherds that appear in Luke into the Magi. Another possible embellishment of the Magi story is their transformation from astrologers to kings. The general view is that this is linked to Old Testament prophesies that have the messiah being worshipped by kings in Isaiah 60:3, Psalm 72:10, and Psalm 68:29. It is possible that early readers reinterpreted Matthew in light of these prophecies and elevated the Magi to kings. Finally, there are Christian groups, such as the Jehovah's Witnesses, who do not see the arrival of the Magi as something to be celebrated . They stress the biblical condemnation of sorcery and astrology in such texts as Deuteronomy 18:10, Deuteronomy 18:11, Leviticus 19:26, Isaiah 47:13, and Isaiah 47:14. In addition, the "star" did not behave like a true celestial body since according to the Magi's own description, the star moved in such a way as to first lead them to Herod and then it led them to the house where Jesus and Mary were (Mathew 2:9, 10). Some critics wonder why "the star" led the Magi first to a hostile enemy of Jesus, and only then to the child's location—the argument being that if this was an event from God, it makes no sense for them to be led to a ruler with intentions to kill the child before taking them to Jesus. Indeed, if due to the activity of this star, or the visit from the Magi, motivated Herod to want to seek out Jesus and destroy him (Mathew 2:13), why would God, knowing this, set up a situation that would lead to a slaughter of innocents two years old and under? 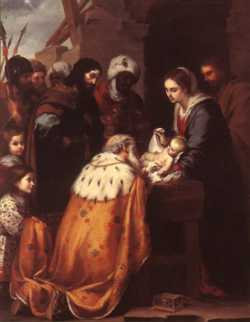 These lingering questions cause some scholars to be skeptical about the story of the Magi. Albright, W.F., and C.S. Mann. "Matthew." The Anchor Bible Series. New York: Doubleday & Company, 1971. Becker, Alfred. “Franks Casket.” Zu den Bildern und Inschriften des Runenkästchens von Auzon. Regensburg, 1973, Ikonographie der Magierbilder, Inschriften. Hill, David. The Gospel of Matthew. Grand Rapids: Eerdmans, 1981. John of Hildesheim. Historia Trium Regum ("History of the Three Kings"). Powell, Mark Allan. "The Magi as Wise Men: Re-examining a Basic Supposition." New Testament Studies vol. 46, 2000. Gundry, Robert H. Matthew: a Commentary on his Literary and Theological Art. Grand Rapids: William B. Eerdmans Publishing, 1982. This page was last modified on 7 August 2018, at 17:59.